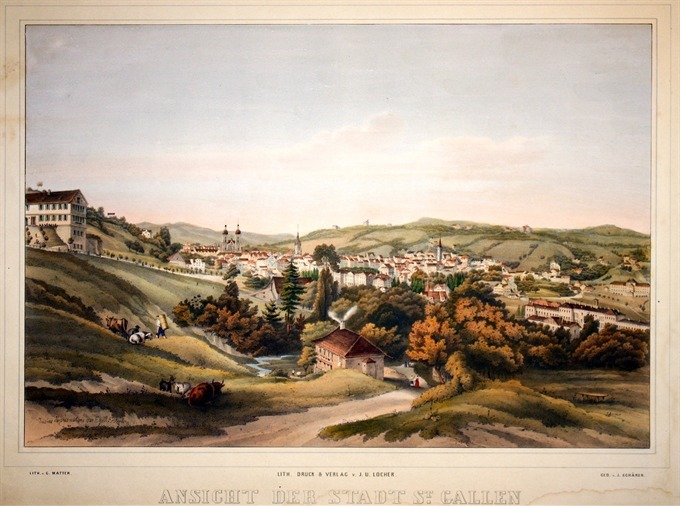 Important tinted lithograph view of St. Gallen by C. Matter. In the bottom left corner “dessine d’aprs nature par Egid. Federle”. Published by J. U. Locher in St. Gallen in 1860. Beautiful prospect view of Schaffhausen with a text about the city. Published in Bodenehr’s Curioses Staats und Kriegs Theatrum. Gabriel Bodenehr (1664 – 1758) was a copper engraver and publisher. In 1716 he bought the copper plates of Johann Stridbeck (1640 – 1716), revised and completed them with his own maps, views and plans, and published them in several works with different titles. Beautiful prospect view of Basel with a text in German about the city. Published in Bodenehr’s Curioses Staats und Kriegs Theatrum. Gabriel Bodenehr (1664 – 1758) was a copper engraver and publisher. In 1716 he bought the copper plates of Johann Stridbeck (1640 – 1716), revised and completed them with his own maps, views and plans, and published them in several works with different titles. 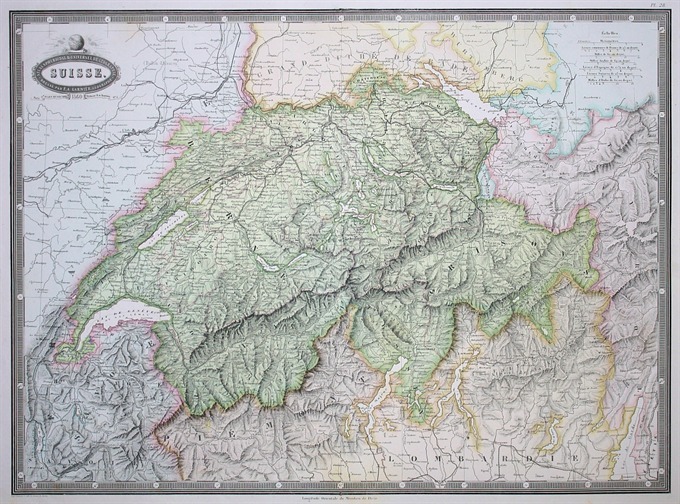 Rare copper engraved map of Switzerland. 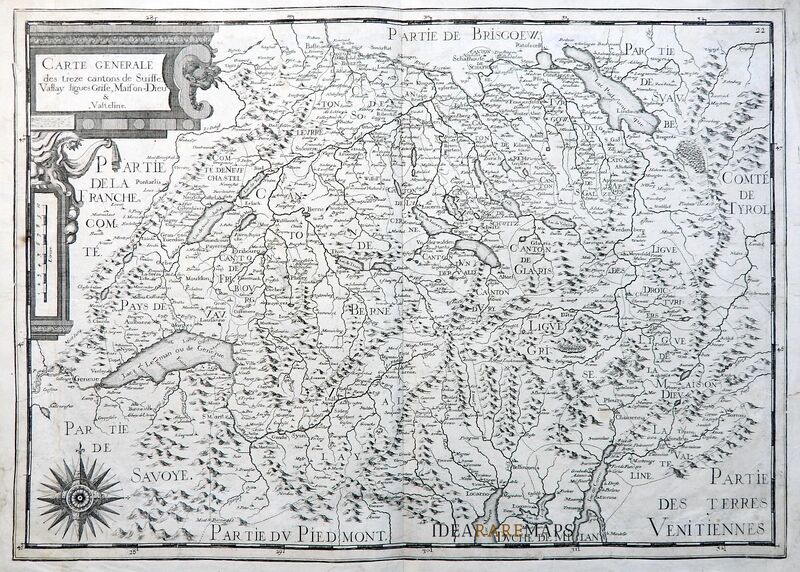 Showing Cantons and other independent regions, towns, villages, landmarks, forests, rivers and mountains. Relief shown pictorially. Includes decorative cartouches and compass rose. 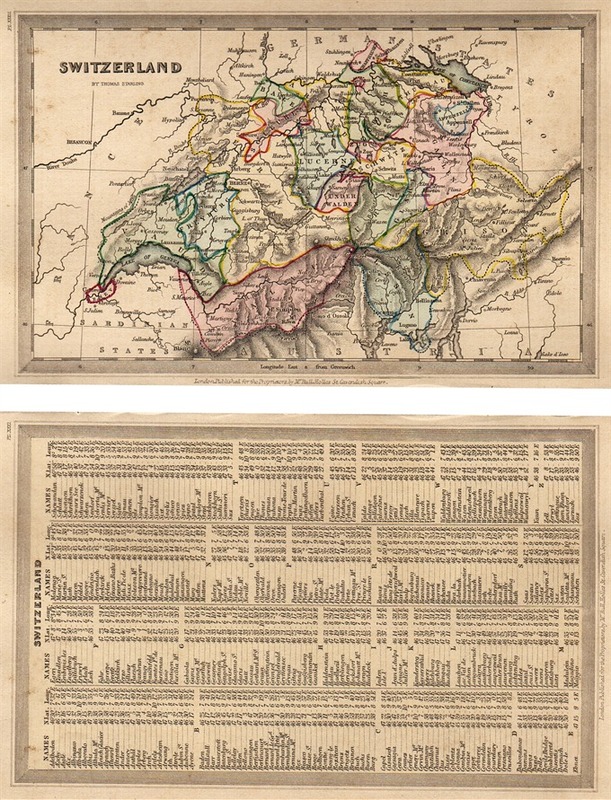 As in the title the map shows also the Valtellina, the beautiful valley in the Lombardy region of northern Italy, bordering Switzerland. 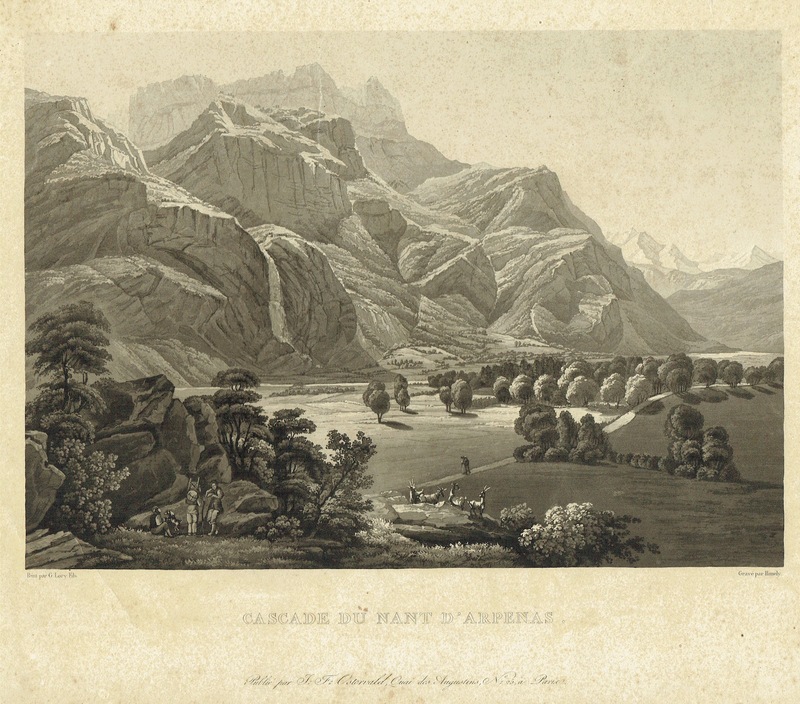 A very nice aquatint view by Gabriel Lory showing the Swiss Alps with the cascade of Nant d’Arpinaz. Published in Paris at Osterwald in 1820. Very fine prospect view of Bern with published in Bodenehr’s Curioses Staats und Kriegs Theatrum. Gabriel Bodenehr (1664 – 1758) was a copper engraver and publisher. In 1716 he bought the copper plates of Johann Stridbeck (1640 – 1716), revised and completed them with his own maps, views and plans, and published them in several works with different titles. A magnificent large and very decorative pictorial map folded in self cover surrounded by notes and illustration of flowers, with the compass rose in the center. Shows buildings. landmarks, peoples, animals, roads, railroads, waterways, churches, tourist attractions, geographical features and places of interest. A short guide by Hans Jenny, and illustrations on verso. Designed by Eduard Imhof after a drawn by Otto Muller. Published by the Swiss National Tourist Office in Bern in 1939. 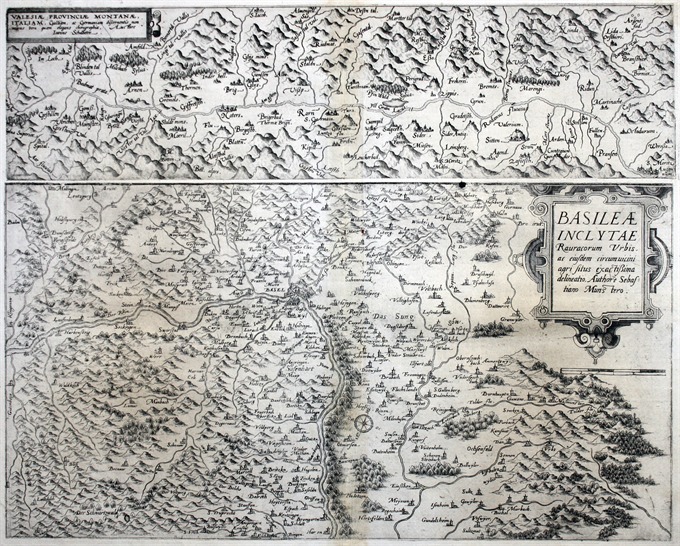 Very rare map engraved by Elias Baeck from ?Der curiose und .. Nssliche Dollmetscher..? 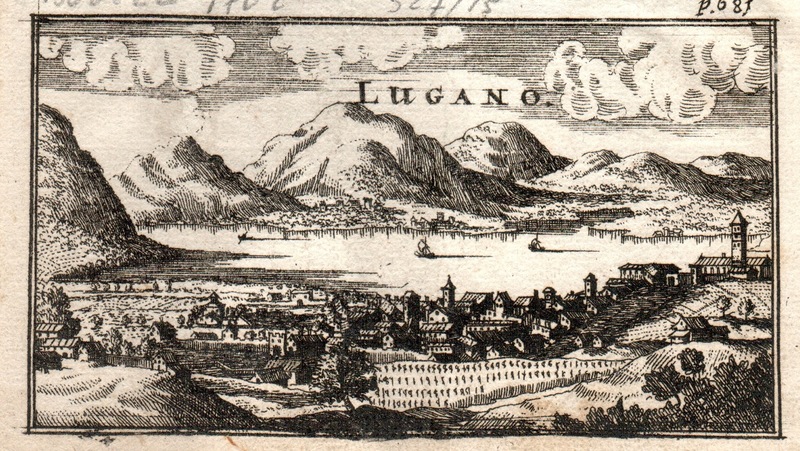 published in Augsburg in 1748. The map has decorative cartouche and a nice original colouring. Missing in many reference. An interesting and scarce pre-war English language tour guide to Japan. Color endpaper illustrations by Hiroshige. According to the preface this is a revision and condensation of the Japanese sections, Vols. II and III, of the Official Guide to Eastern Asia, 1914. With 36 maps, 14 town plans and 10 illustrations. 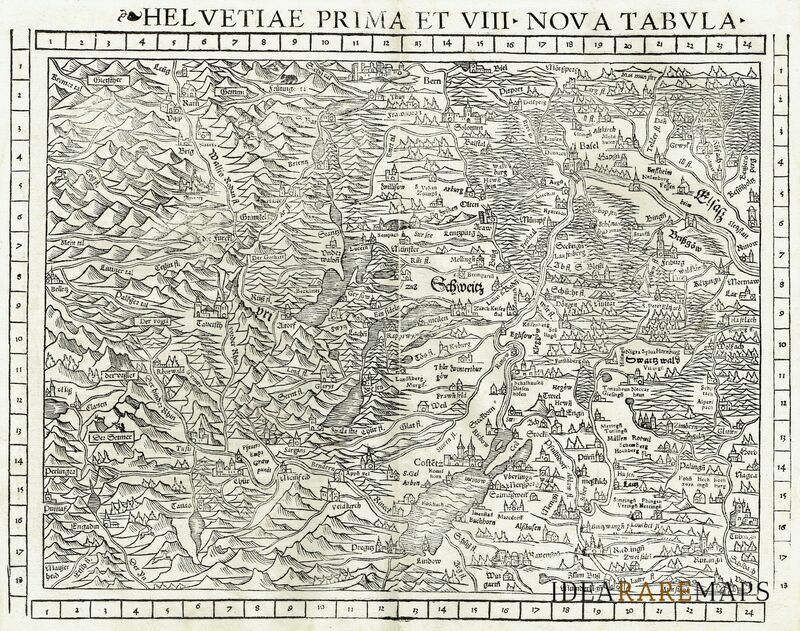 Important woodcut map of Switzerland and the Alps, with north oriented to the right from the Munster’s “Geographia Universalis” published in Basle in 1552. 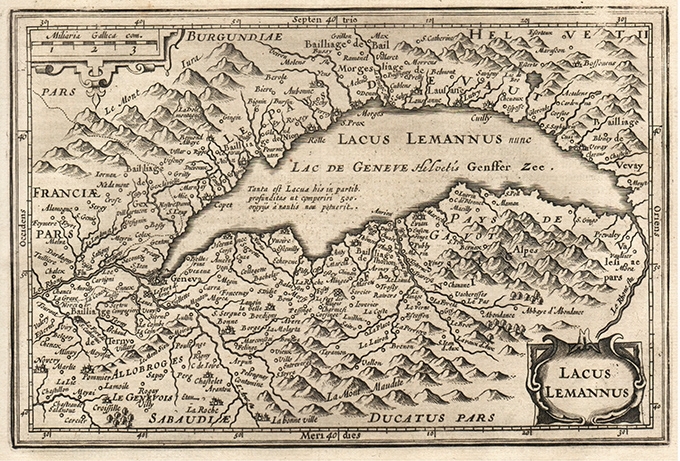 This is the only edition of the map with the distintive longitude and latitude borders. The decorative woodcut panel on verso is attributed to great old masters Hans Holbein. 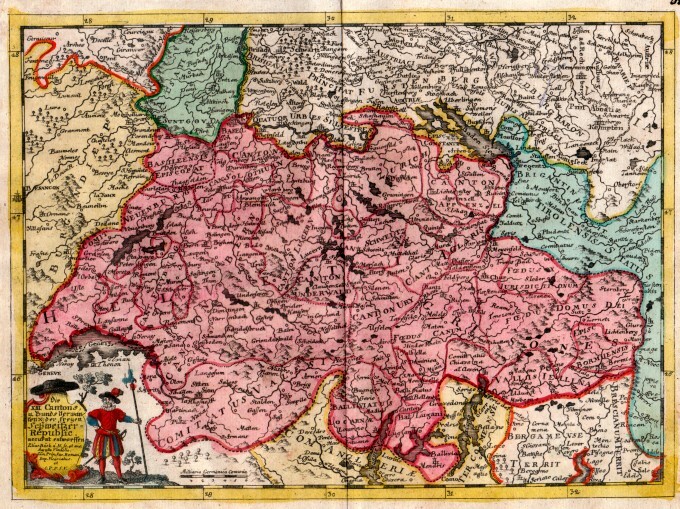 One of the earliest obtainable maps of Switzerland. Munster’s Geographia was a cartographic landmark, including not only Ptolemaic maps, but also a number of landmark modern maps, including the first separate maps of the 4 continents, the first map of England and the earliest obtainable map of Scandinavia. Munster dominated cartographic publication during the mid-16th Century. 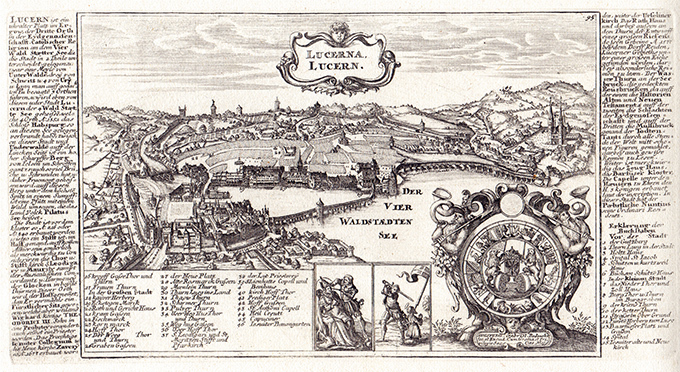 Stunning prospect view of Lutzern at the left and right side with a text about the city. Published in Bodenehr’s Curioses Staats und Kriegs Theatrum. Gabriel Bodenehr (1664 – 1758) was a copper engraver and publisher. In 1716 he bought the copper plates of Johann Stridbeck (1640 – 1716), revised and completed them with his own maps, views and plans, and published them in several works with different titles. 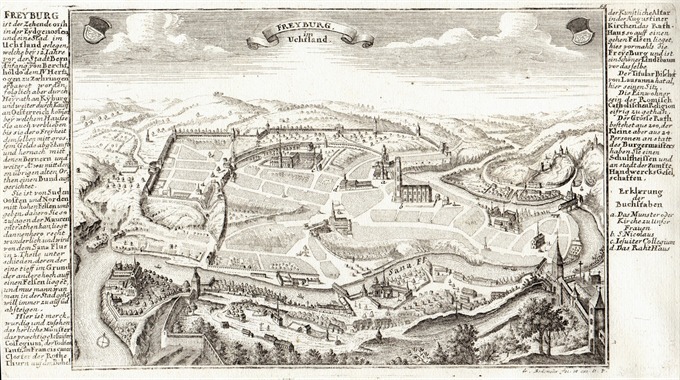 Very rare view of the town engraved by J. Buggel. 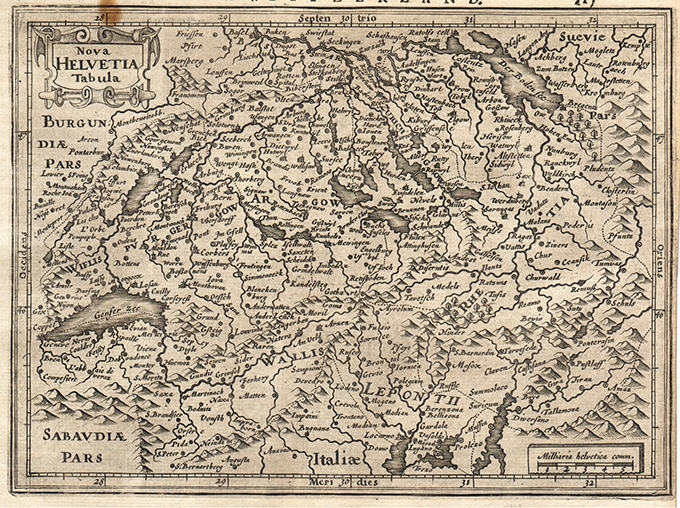 From: “Das Neu-geharnischte Meyland…” by German Adlerhold, published in Nuremberg in 1702. Beautiful prospect view of Fribourg at the left and right side with a text about the city. Published in Bodenehr’s Curioses Staats und Kriegs Theatrum. 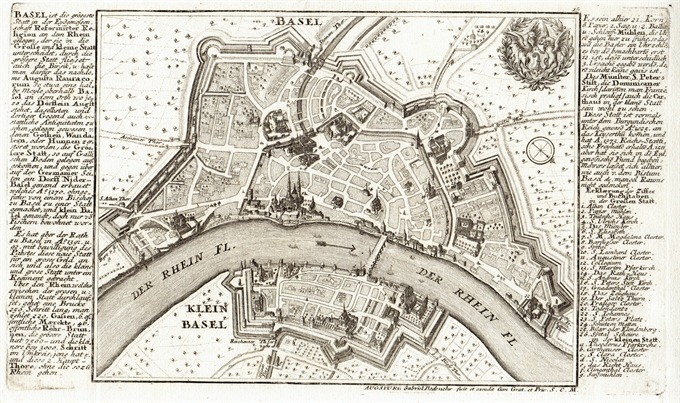 Gabriel Bodenehr (1664 – 1758) was a copper engraver and publisher. 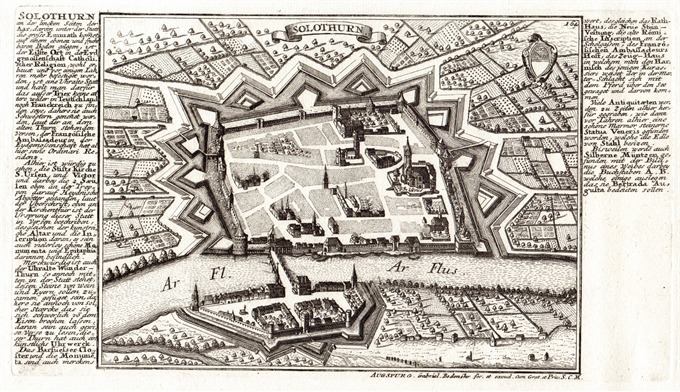 In 1716 he bought the copper plates of Johann Stridbeck (1640 – 1716), revised and completed them with his own maps, views and plans, and published them in several works with different titles. 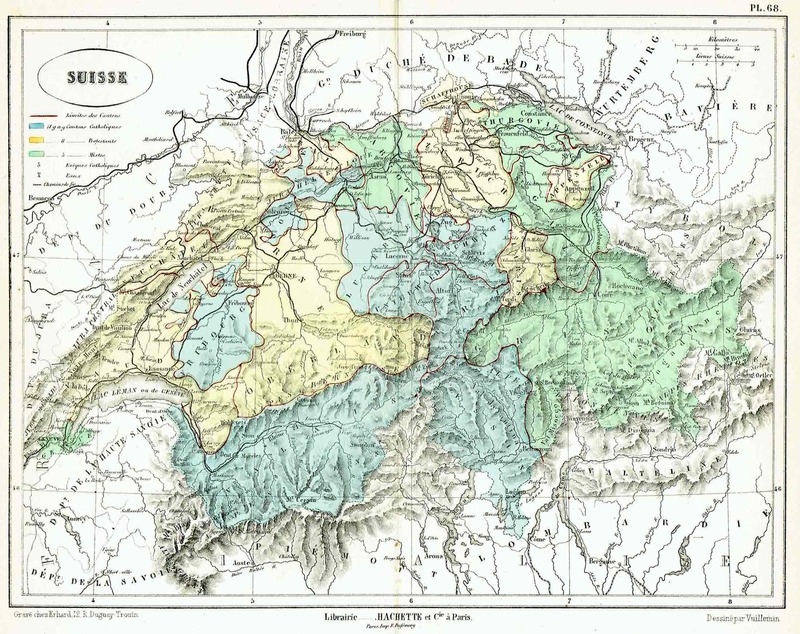 Detailed lovely map by Eduard Dumas-Vorzet showing the whole Switzerland. From the famous Atlas Universel d’Histoire et de Geographie by Marie Nicolas Bouillet published in Paris in 1877. 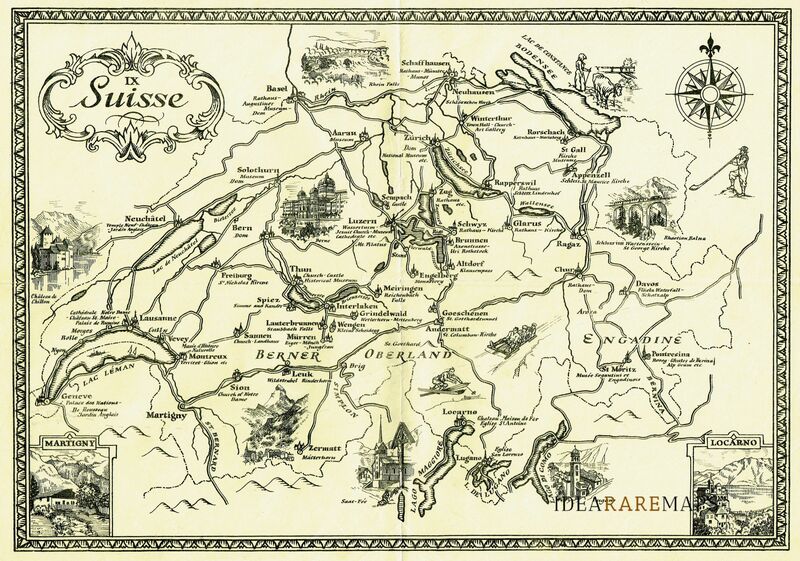 A particularly attractive pictorial map of Switzerland by anonymous author published in 1930 circa. This map is covered with beautiful vignettes describing major towns and very nice landmarks along the roads like skiers or cows. Includes decorative cartouche, compass rose and inset lovely views of Locarno and Martigny. Uncommon. An attractive miniature map of Switzerland by Thomas Starling from popular Victorian atlas “The Royal Cabinet Atlas, And Universal Compendium Of All Places In The Known World” published by Bull and Churton in London in 1833. The map is accompanied by a page of text giving the latitude and longitude of the major towns. 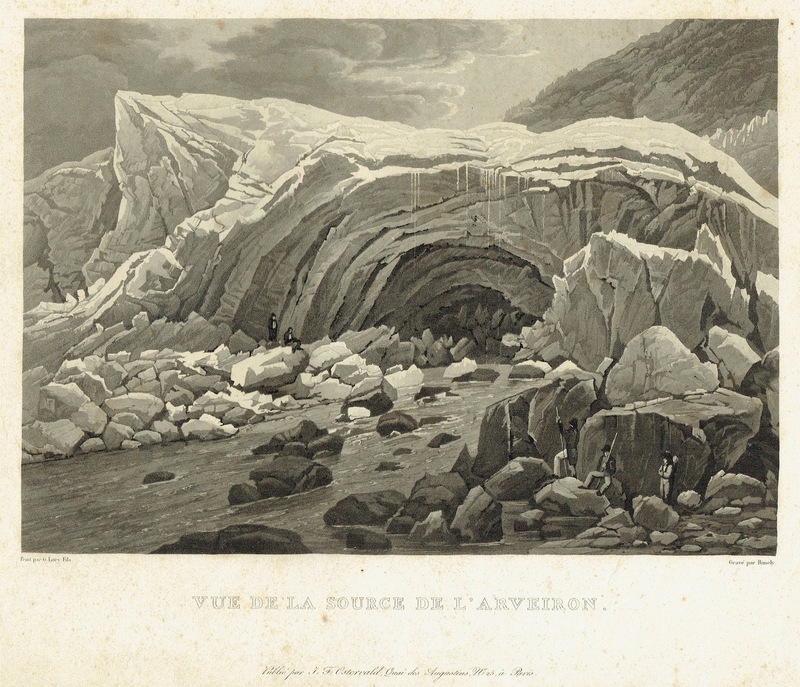 A very nice aquatint view by Gabriel Lory showing Mont Blanc glacier at the foot of a hill with a stream flowing from it and some bare rock in the foreground; two figures on the left of the mouth of the cave and three in the right hand foreground. Published in Paris at Osterwald in 1820.